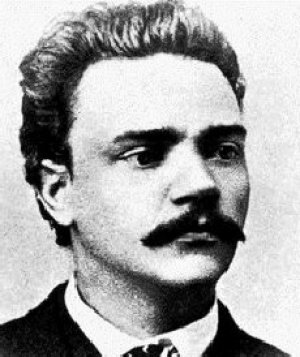 Antonín Leopold Dvořák was born on September 6, 1841, in the small village of Nelahozeves in Bohemia one of seven children of the local butcher who also kept the village inn. The love of the countryside in which he grew up never deserted him and seems ever present in his music, which however urbane, is never far from the Slavonic folk tradition. As a youth he showed considerable musical talent, performing on piano, organ and viola and studying counterpoint. From 1857 to 1859 he studied music in Prague, after which he became a professional viola player at first in a band but later, from 1866 to 1873 in the orchestra of the Prague National Theatre. Here he played in the first performance of the Bartered Bride under the baton of Smetana himself. At this period he began to establish himself as a composer of importance with his third symphony completed in 1873 and the fifth in 1875. He had come to know works of Schubert, Wagner and Brahms who clearly influenced his style. The Romance F minor takes much of its material from the second movement of Dvořák’s string quartet in F minor Op.12, which was composed in 1873 but never publicly performed in the composer’s lifetime. A version for violin and piano was completed in 1877 and the version for violin and orchestra was published in 1879. The orchestral version is not an arrangement of the quartet movement but rather a free reworking of the same ideas. Clearly Dvořák recognised that he had written a great piece and wanted to get the most out of it. The work is built out of two linked ideas. The first is a song like melody, heard high on the violins at the outset, and then freely elaborated by the soloist who weaves intricate melodic patterns around the other orchestral players. The second idea is again a romantic melody, less elaborate than the first with the soloist soaring high above a running orchestral accompaniment. The middle section is much more dramatic with virtuoso figures played by the soloist punctuated by dramatic outbursts from the orchestra. It is only short lived and the mood of tranquillity is restored with the return of the first idea. The piece moves into the tonic major when the second idea returns and a brief coda draws it to a close. The romance is a highly characteristic work of Dvořák, combining his deep understanding of classical form and romantic harmony with beautiful flowing Slavonic melody. The reworking of the piece from the string quartet movement into a romance was done at a time of great tragedy in his life. In 1877 he lost three of his children, one pre-natal, one through an accident and the third to smallpox. Perhaps these events contributed to the emotional intensity of the work, the rending harmonies and the lyrical beauty of the violin writing. Dvořák's Romance was performed by the Portobello orchestra on the 1st April 2006. The soloist was Madeleine Easton and the conductor was Anthony Weeden.